The end of September brought us the 25th annual International Coastal Cleanup, where thousands of volunteers took to coastal areas around the world to pick up garbage. To coincide with this event, the First Friday Films series will feature TRASHED - the story of garbage...American style. 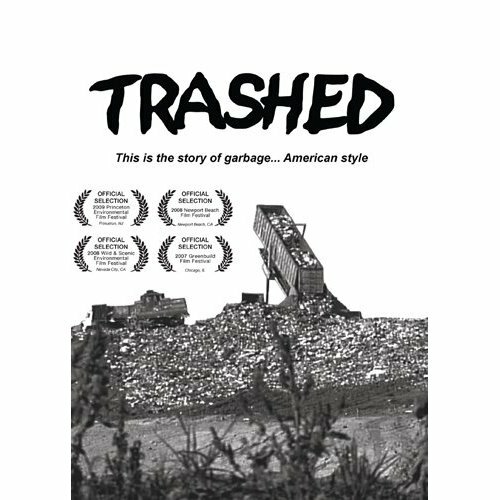 Official selection of the Newport Beach Film Festival, TRASHED takes us headfirst into the world of garbage. The documentary aims to show the world just what happens to solid waste after it leaves our hands and homes. With staggering facts such as 370 million tons of trash land-filled annually, or 1.37 billion cubic kilometers of ocean full of plastic, TRASHED encourages viewers to rethink the way that we consume products, reconsider the amount of waste we produce, and refocus on the pervasive environmental issue of over-consumption. Directly following the movie, Steve Hiney from the Solid Waste Division of Public Works will be talking a little trash and answering audience questions. Please join us for this eye-opening look at the effects that our throw-away culture is having on the environment. 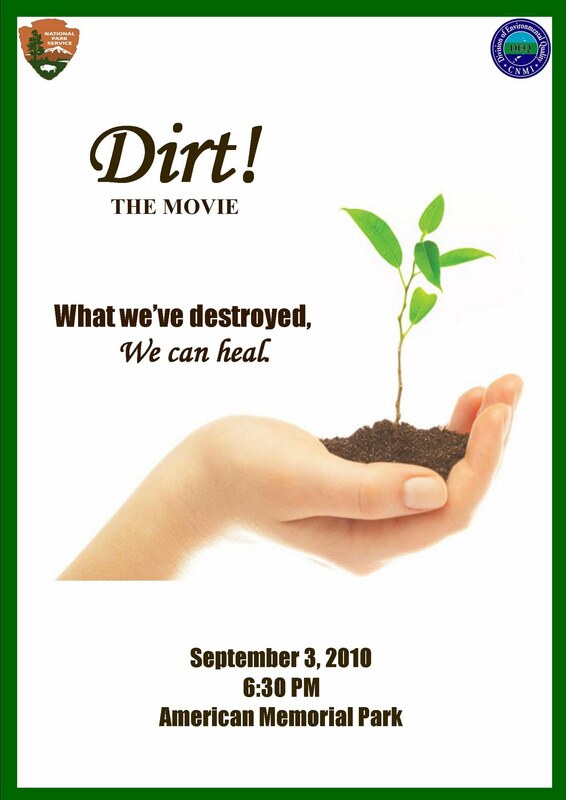 The film will be shown at the American Memorial Park Visitor's center at 6:30pm on October 1st. As always, it's FREE! Come early, as we will have free reusable grocery bags for the first 50 people and some great lobby exhibits (doors open at 6:00pm). "Pulitzer price winning author Russell Baker once said "The American dream is to turn goods into trash as fast as possible." Nowhere is this better illustrated than in Bill Kirkos' film Trashed. This film is a must see." 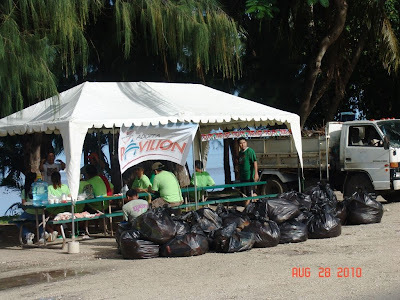 PDM Promoters, Inc. and the Saipan Awaodori team of Koblerville cleaned up from the Garapan Fishing Base to Hafa Adai Hotel last Saturday 9/25/10. THANK YOU ALL SO MUCH FOR THE GREAT JOB YOU ALL DID! Thanks and please keep up the great job! 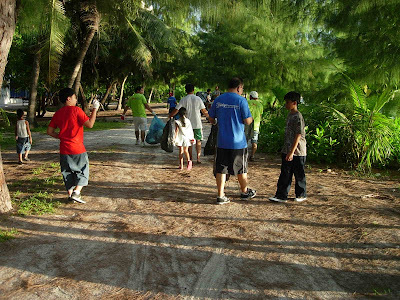 Participating in the annual International Coastal Clean Up event organized by CRM and NOAA-Marine Debris Program, the Rotary Club of Saipan gathered Saturday 09/25/2010 from 8am-11am to pick up trash at the Garapan Fishing Base area. 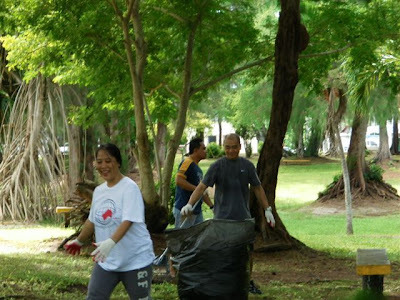 Twenty (20) volunteers collected about 500 lbs of trash while several other Rotarians were involved in clean ups at other sites. Most of the collections at Fishing Base consisted of plastic bottles, cans, food wrappers and cigarette butts. The most unique item found was a popcorn machine. Over a thousand government and private sector employees, organizations, their families and students are taking part in environmental protection by joining the international coastal cleanup that began yesterday and continues today on Saipan, Tinian, and Rota. 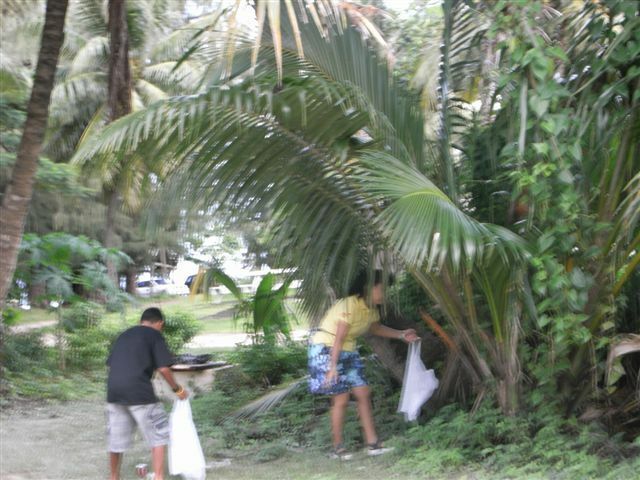 “Even though it's payless payday today for us, we still want to volunteer our time and effort to keep our island clean. We don't need to get paid in order for us to protect our environment,” said Jocelyn Aldan-Kapileo, an employee at the Department of Public Lands. DPL was one of the agencies and groups that began their cleanup yesterday despite the alternating sun and rain. Most of the volunteers will be cleaning up coastal areas, roadways and tourist spots this morning. As of yesterday afternoon, at least 58 groups with over 1,320 volunteers have signed up with the Coastal Resources Management, which is the lead agency coordinating the cleanup. 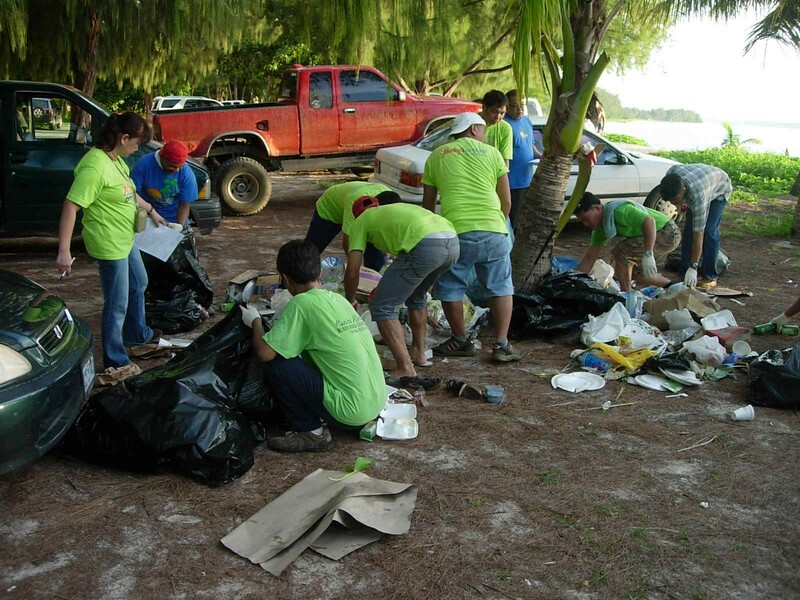 Rachel Zuercher, CRM planner and coordinator for the 2010 coastal cleanup, said more volunteers have signed up this year than last year. 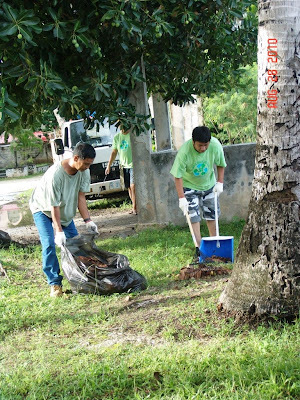 “It's very encouraging for us (CRM) to see so many of Saipan's citizens taking an active role to ensure the health and beauty of the coastal ecosystems of the CNMI,” Zuercher told Saipan Tribune. 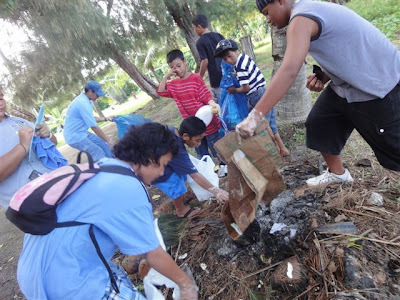 Volunteers are encouraging citizens to always pack trash after picnics, pick up any litter they see, and most importantly, cut down on disposable goods. “By using refillable water bottles, refusing plastic bags at the grocery store or market, and buying goods with less or no packaging, we can make an even larger impact on the health of our environment,” Zuercher added. Raymond Cruz, compliance director at DPL, led seven other DPL personnel armed with black trash bags and gloves in picking up 60 to 70 lbs. 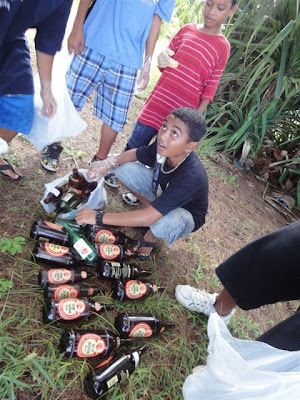 of trash from the roadside fronting Northern Marianas College to the As Lito/Dandan intersection where the Shell gas station is located. “It makes us feel more responsible for the environment. I just wish that people won't leave their trash anywhere they want,” he said. The unforgiving sun at 12:45pm to almost 2pm made the cleanup much harder for many. In the San Antonio area, 10 Pacific Islands Club personnel picked up trash along the road and on the beach sites near PIC starting at 2pm yesterday. Evan Hunsberger, PIC training manager, said they decided to hold their monthly cleanup yesterday to coincide with CRM's coastal cleanup. 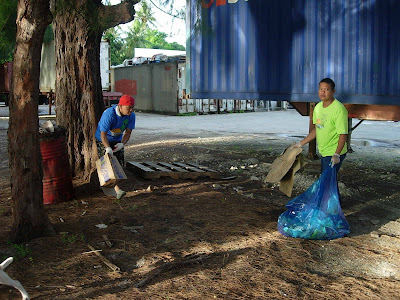 “Our business is tourism and one of the important things we do to keep this island clean and beautiful for our tourists is to pick up trash along the roads and in the beach areas. 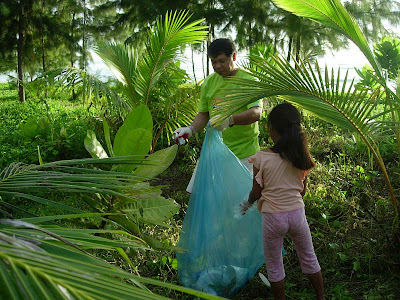 We want our guests to appreciate this island,” said Hunsberger, who was among those picking up trash by the road along with PIC's Su Jung Lee, Ray Moreno, Dennis Tababa, among other hotel personnel. 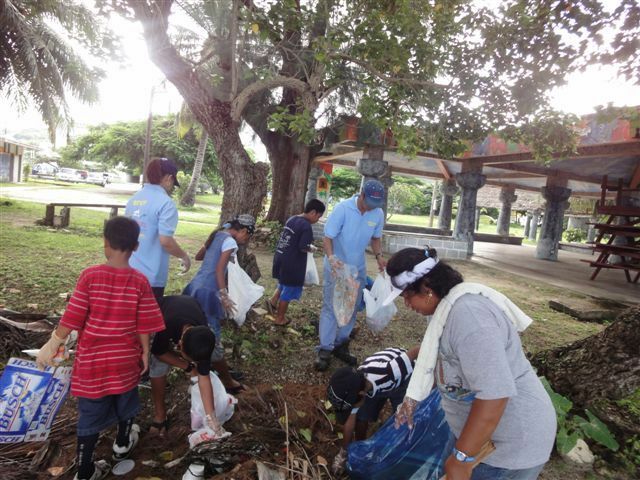 The CNMI joins the rest of the world in the international coastal cleanup, the world's largest volunteer effort to help protect the ocean. 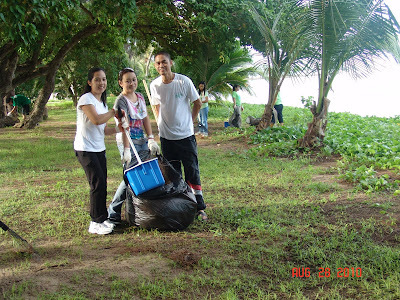 For young and old volunteers, spending an hour or more to pick up trash is an investment for future generations. 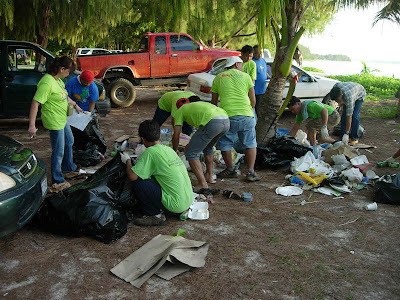 Trash is one of the most widespread pollution problems threatening the ocean and waterways. Others also consider the cleanup as a temporary reprieve from the economic woes and a threat of a government shutdown. 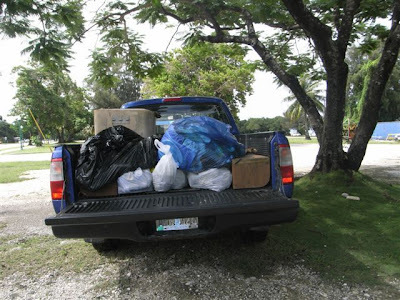 While CRM is the lead agency coordinating this year's coastal cleanup, the Division of Environmental Quality's Joe Kaipat is coordinating all trash pickup. 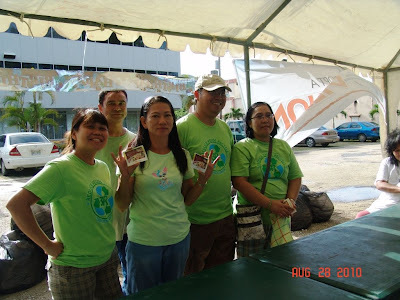 Besides CRM and DEQ which also provided bags and gloves to volunteers, also instrumental in the event are the trailers and trash bins from the Department of Public Works and Department of Lands and Natural Resources/Parks and Recreation. 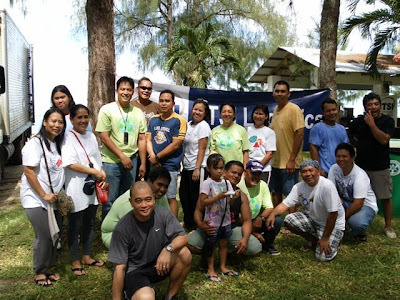 The Marianas Islands Nature Alliance also donated reusable bags for participating groups. Beautify CNMI has also assisted with publicity. “It is certainly a huge group effort,” Zuercher added. The cleanup locations cover different areas on Saipan, Tinian and Rota. 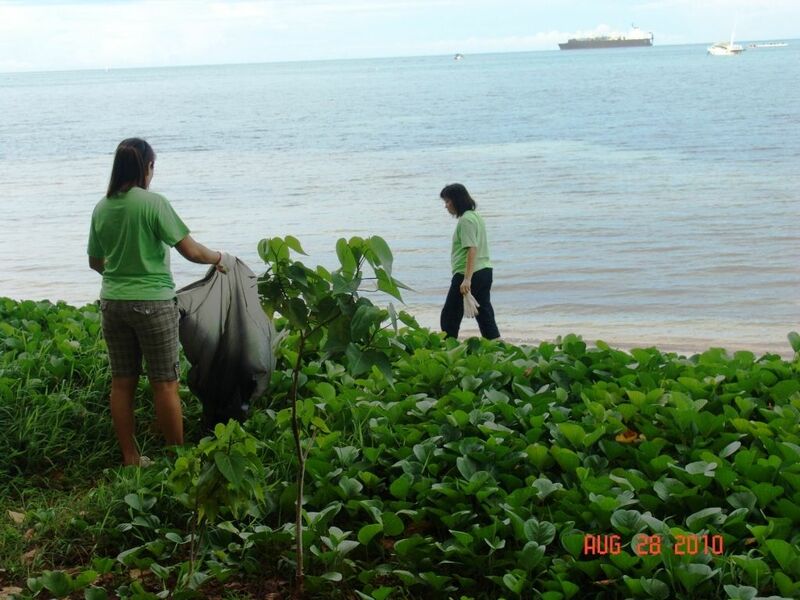 Last year's cleanup diverted hundreds of bags of trash from CNMI's shoreline, and disposed of the waste properly. This year, on the 25th anniversary of the international event, CRM and DEQ are hoping to make an even larger impact. “The event teaches the CNMI community that proper disposal of trash on land is extremely important to the health of the marine environment. What we throw on land ends up in our waterways and ocean,” Rota coordinator Bill Pendergrass earlier said. 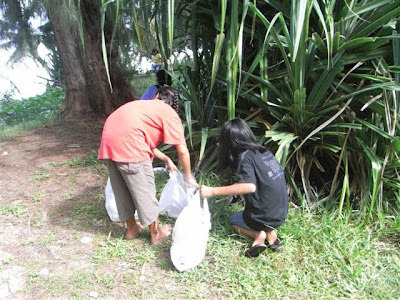 The event aims to highlight the impact that volunteers working over just a few hours can have on the state of coastal areas. Brabu Pharmacy (from Brabu on Middle Road to the 13 Fishermen Monument), Century Group of Companies and Saipan Tribune (back of TSL Plaza), City Trust Bank (Beach Road from Oleai going south), CNMI WIC Program (San Roque Beach), Committee to Elect Gregorio Kilili Sablan (Kilili Beach), and CTSI Logistics (Susupe Park). 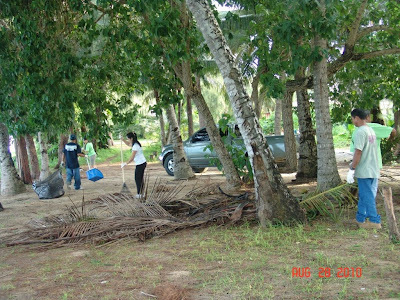 Also joining are D&Q Saipan Co. Ltd. and Cosmos Distributing (Tanapag Beach across from the church), DFS Saipan Ltd. (Old Man by the Sea), Department of Lands and Natural Resources (normal Parks and Recreation Division routes), DPL (Dandan roadside), Fiesta Resort & Spa (Makaka Beach), Friends of the Mariana Islands (South Laolao Beach pavilion), Grace Christian Academy (Micro Beach/Smiling Cove), Guangdong Development Co. Ltd. (Lally 4), Hyatt Regency Saipan (Micro Beach), and IT&E/Shell Marianas/Saipan Southern High School (Oleai Bar to MVA). The list also has Kagman Elementary School (Tank Beach), Kagman High School Marine Biology Club (Tank Beach), Kagman High School National Honor Society (Ladder Beach), Mariana Islands Nature Alliance (Paupau Beach), Marianas Baptist Academy (Pakpak Beach), Marianas Trekking (Wing Beach road and forested areas), Marianas Visitors Authority/NMDOA (North LaoLao Beach dive site), Marianas Water Works Corp. (Cow Town Beach), and Mount Carmel High School (Middle Road). CRM also listed No Ka Oi Saipan (Paupau Beach), Northern Islands Mayor's Office (Carolinian Utt), Northern Marianas Academy (Jeffries Beach), Northern Marianas Badminton Association (Ada Gym), Northern Marianas College's Environment and Natural Resources Organization (Forbidden Island), Office of Rep. Joe M. Palacios (R-Saipan) and Rep. Eli Cabrera (R-Saipan) (Obyan Beach), and the Office of Rep. Tony Sablan (R-Saipan) (north of PIC to San Antonio Elementary School). 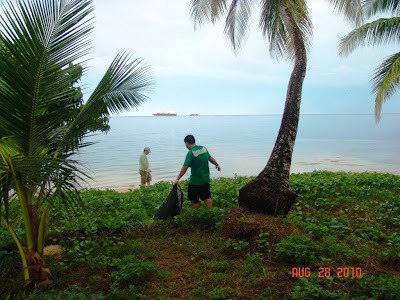 The list also includes Pacific Marine Resources Institute (Quartermaster to 13 Fishermen's Monument), PDM Promoters (Hafa Adai Hotel to Garapan Fishing Base), PIC Saipan (Agingan Point to PIC), POI Aviation (Obyan Beach), Port Users and Operators Committee (Unai Sadog Tasi in Lower Base), Phi Theta Kappa (13 Fishermen's Monument to Garapan Fishing Base), and Rotary Club of Saipan (Fishing Base). 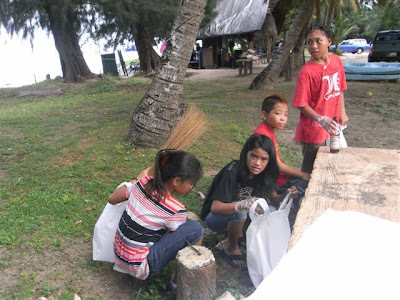 Completing the list of volunteers are Saipan Grand Hotel (Sugar Dock to Saipan Grand Hotel), Saipan International School (Coral Ocean Point), Saipan Marianas Lions Club (Beach Road Pathway), Saipan Mayor's Office (Wing Beach), Saipan Seventh-Day Adventist (San Antonio from SDA School), Saipan Southern High School JROTC-Manta Ray Battalion (Lally 4), Saipan Swim Club (Marine Beach), SHARC (Outer Cove/Seaplane ramps), Saipro 4-H (4-H building and beach), Shirley's Coffee Shop (Sugar Dock heading south), SSFM International Inc. (Garapan), Tsunami Swim Club (Managaha), U.S. Coast Guard (Bird Island Beach), and Winzler & Kelly (Quartermaster south to 13 Fishermen Monument). Below is the latest update from Rachel on the Saipan International Coastal Cleanup coming up this weekend! WOW! 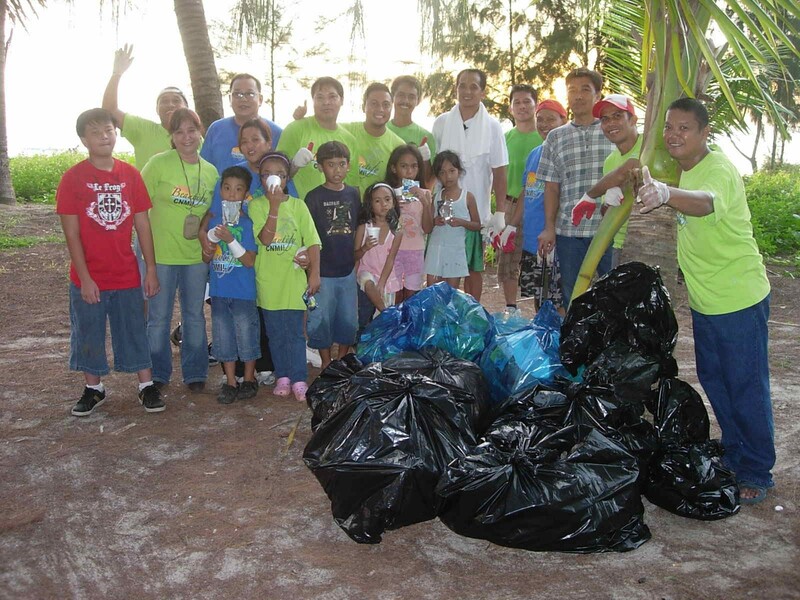 More than 1000 members of the Saipan community will be out on Friday and Saturday to combat marine debris! We have 44 registrations in and more coming every day. EVERY BEACH AREA THAT WAS LISTED ON THE REGISTRATION FORM (and quite a few more) ARE ADOPTED!! This is great! 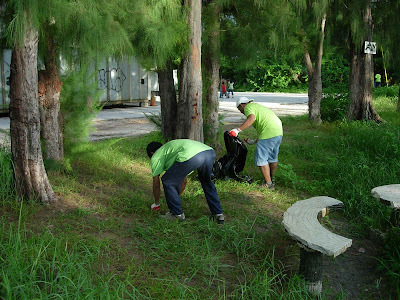 As so many of the beach areas are covered, the Coastal Cleanup Team is encouraging groups to adopt school compounds, neighborhoods, roadsides and known illegal dumping sites. All trash on land will end up in the sea - let's cover the entire island. A big thank you to our partner agencies - Department of Lands and Natural Resources and Department of Public Works - for allowing us the use of trash bins and hauling trailers! 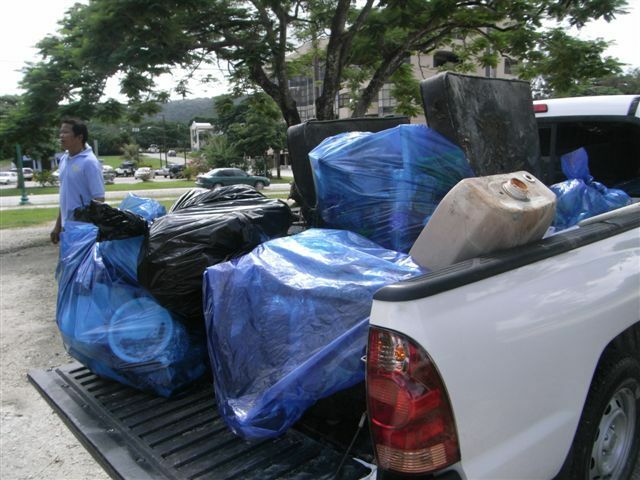 **IMPORTANT: All volunteer groups, please stop by the Coastal Resources Management office on 22-23 September (7:30-4:30) to pick up trash bags, gloves and marine debris data sheets. See you there! This year the National Urban and Community Forestry Advisory Council has revised its grant categories and process to the Forest Service’s National Urban and Community Forestry Challenge Cost Share Grant Program. They anticipate $855,000 in funding. Pre-proposals and Full proposals selected from the pre-proposals will be required. There are three Innovation Grant categories based on one of the Council’s identified priority areas. The 2011 U.S. Forest Service Urban and Community Forestry Challenge Cost Share Grant (CFDA 10.675, Opportunity No. USDA-FS-UCF-2011) instructions and application are posted on www.grants.gov. The instructions may also be downloaded here. Applications are due by 11:59 PM, November 29, 2010 to http://www.grants.gov/. Use the free Adobe Acrobat Reader to download and fill out application. The Grants.gov Help Contact Center is Open Monday - Friday, to help you with issues regarding Grants.gov. Hours 7:00 a.m. to 9:00 p.m., Eastern Time. Email support@grants.gov or call 1-800-518-4726. If interested applicants are not already registered in http://www.grants.gov/, they are encouraged to register now. The process may take up to two weeks to collect the required information. 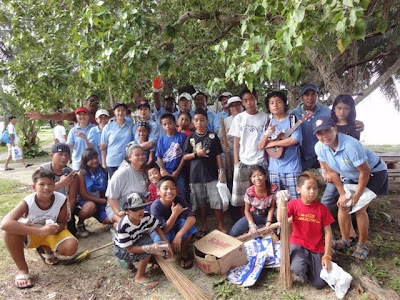 The community is coming out en masse to combat CNMI's marine debris! We have 33 registrations in and more coming every day. Currently, the open beaches are: Bird Island, Forbidden Island, Jeffries Beach, Old Man By The Sea, San Roque and the Dandan pocket beaches. 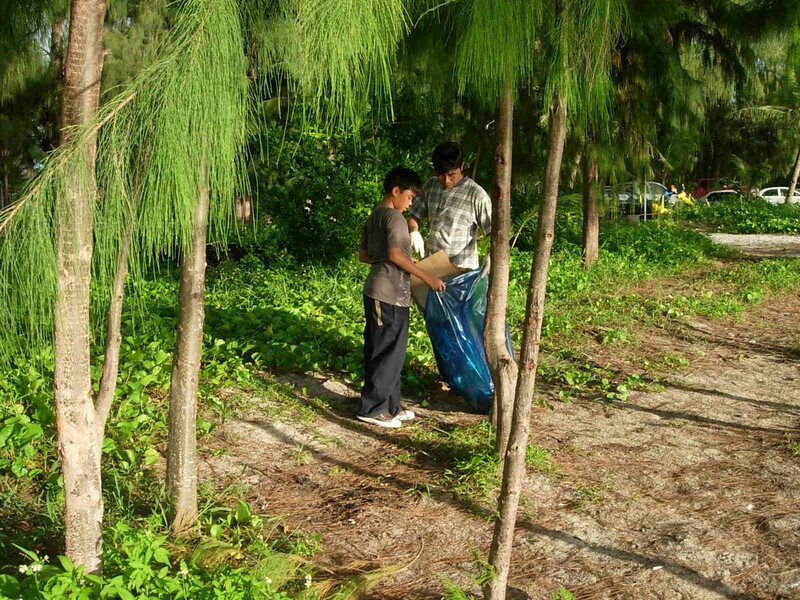 As so many of the beach areas are covered, the Coastal Cleanup Team is encouraging groups to adopt school compounds, neighborhoods, roadsides and known illegal dumping sites. All trash on land will end up in the sea - let's cover the entire island. 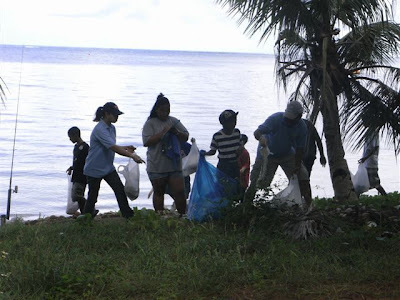 **All volunteer groups, please note that the Coastal Resources Management office will be open on 22-23 September for group leaders to pick up trash bags, gloves and marine debris data sheets. 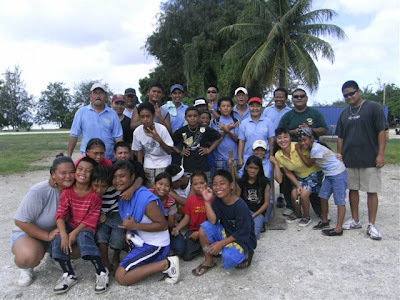 Carnival of the Blue XL: Top of the Food Chain is now posted at the Saipan Blog. Carnival of the Blue is a rotating monthly compilation of the "best of" ocean blogging, bringing together ocean bloggers and readers and (hopefully) using new media to build a virtual community of ocean lovers. Companies stationed at JP Center (Saipan Tribune, L&T, CIC & Tan Holdings Support Team) gathered again for the 6th Adopt-A-Pavilion activity and to hold the month of August's birthday bash. 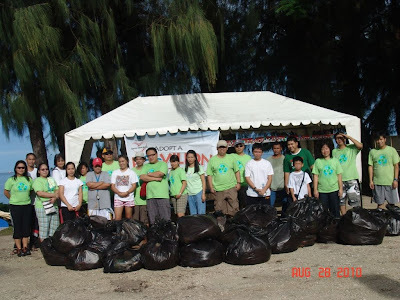 A total of 33 volunteers showed up as early as 6:30 a.m. and collected about 35 bags or approximately 536 kilos of trash from the coastal area/shorelines at the back of TSL Plaza, McDonald's, and Office of the Personnel Management on Saturday, August 28. 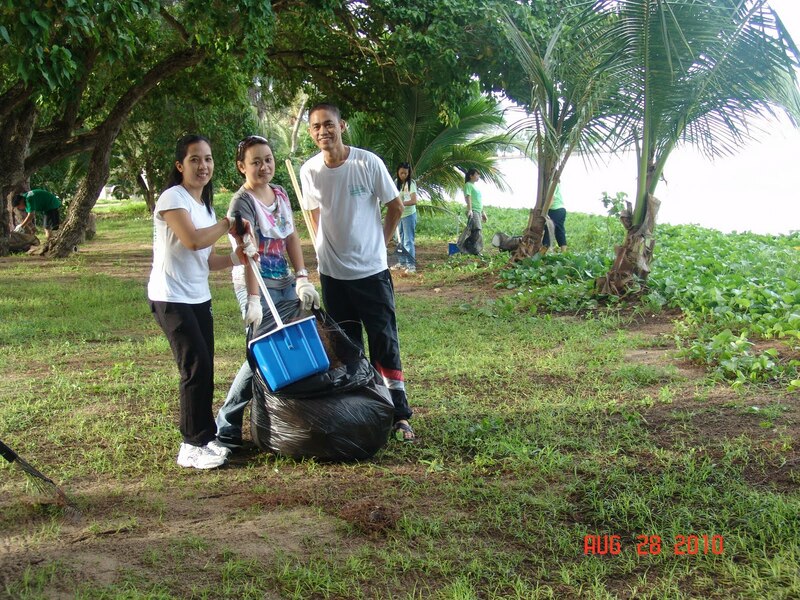 To date, the team has already collected an estimated 125 bags or 1,868 kilos of trash since it started the project in March of this year. 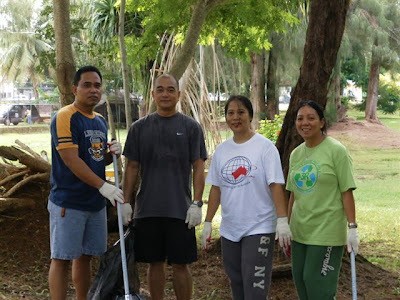 Cecil Ramores of Tan Holdings said "We are committed to giving back to our community and look forward to continuing our drive through our monthly clean ups and pavilion rehabilitation project." CTSI also had their regular monthly clean-up the same day at the Susupe Beach Park. The 17 volunteers were able to gather 68 bags or 618 kilos of trash. GREAT JOB, EVERYONE! THANK YOU! THANK YOU!